We decided to standardize AceProject Mobile’s menu and follow the trends in that regard. Lately, we’ve been noticing several mobile apps that brought up a new kind of collapsible menu at the upper left (Facebook is a well-known example). 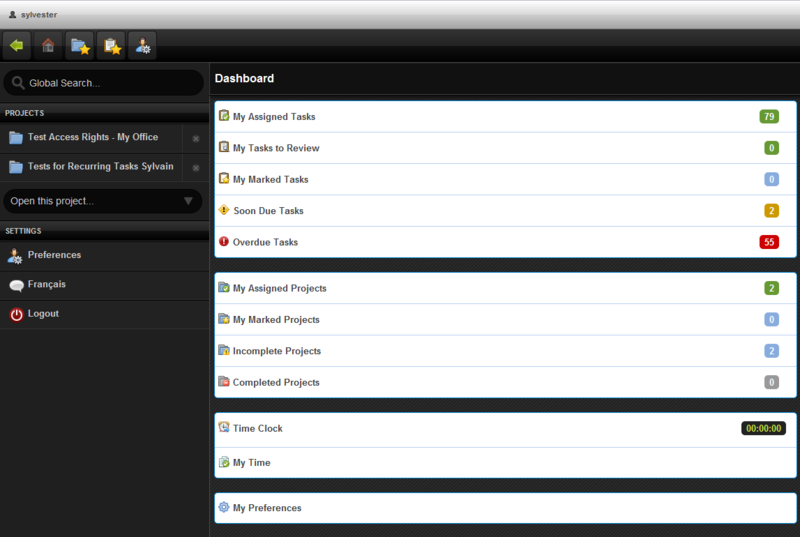 This menu usually acts as a dashboard that contains key actions in the application. We felt the need to add such a menu to AceProject Mobile, for ergonomy reasons. Among other things, this menu includes the Global Search (which we added to AceProject in late 2011), the open projects (similar to the multi-project tabs in AceProject) and quick access to “My Preferences”. When using a smartphone, the menu is collapsible. If you use a tablet or a traditional computer, the menu is always visible. We also added a page loading animation for the usability-savvy. Coming soon, we’ll enter Apple’s App Store thanks to a native app for iPhone and iPad. This app will have the same behavior as the Android app. Basically, it will simply act as a gateway between the device and the web app. We are also working hard on recurring tasks. We plan to launch them as beta initially. We’ll keep you posted! Oh NO!! !, the new sidebar ‘global search’ area on the left has killed my production team, they absolutely hate it, as they have lost a third of their screen space. Is there a way to remove it or make it hidden at all? Could you please tell me precisely what device(s) and OS version(s) your production team members are using? I will take that information to our tech staff and see if anything can be done. The problem is resolved, it was basically the fact that we were using Android Tablets. We have now switched them over to using their PC’s and everything is fine. Are there plans to add the ability to enter in your time(not use the startstop time) in future releases of the android tablet app? Incorporating manual time entry is clearly the most requested feature for our mobile apps. Yes, we will be adding that functionality for sure. However, we plan to make significant changes to our data model as it pertains to time tracking. This overhaul will precede the integration of manual time entry into the AceProject mobile apps as we do not want to add this functionality now and then have to rewrite the code after the changes to the back end.